Restrictions against the general public procuring powerful and often dangerous poisons, drugs, and remedies are a fairly recent development in history. A time once existed when children could smoke cigarettes, arsenic was supplied by your friendly neighbourhood pharmacist, and medication and healing were a mish-mash of druggists recommendations, physician’s advice, and longstanding home- cures. This system remained generally unchanged until medical science began to accept germ theory and cast away humourist ideas about the inner-workings of the human body. Likewise, the druggist’s profession grew out of its alchemy roots, and only with a more modern understanding of chemistry did molecular compounds and chemical interactions bring a truer knowledge of the cures and poisons pharmacists held providence over. Dan Malleck’s study, When Good Drugs Go Bad originates in this world. He draws upon extensive newspapers, scientific journals, pharmacy records, medical association files, asylum records, and case books to interweave the dynamic social, economic, and cultural factors that began the big push towards drug regulation in Canada. On one side you had moralists who expounded temperance and the degenerating effect that drugs like alcohol, tobacco, and opium had on the individual and society as a whole. On the other, physicians and druggists who saw themselves as both an authority and steward over the health and destiny of their fellow citizens’ development. Malleck first gives us a glimpse into the pre-modern medicinal landscape before he delves into the importance of opium’s appearance on the world stage, which, just as it is prominently referenced in the title, takes up the vast majority of his focus in this work. Before opium, the “open medical marketplace” reigned. Health professionals were scarce, and home remedies were more akin to cooking, whose recipes may or may not contain powerful drugs. Honey, lemon, herbs, and rum served to sooth sore throats just as well as other means, and its cost, potency, and limited availability meant few self-medics were turning to opiates regularly. Opium, brought to Canada by the imperialist and economic venture of Britain into China, existed mostly in the sphere of the physician and druggist, or in tinctures, such as Dover’s Powder, sold throughout the country. Doctors in the nineteenth-century viewed the public’s access to opium to be troublesome. Its combined poison and medical nature meant, as one doctor pointed out, that it was the “most important remedy of the Materia Medica” and yet, as Malleck shows, it was blamed for more accidental, suicide, and infant poisonings than all other available drugs. Soon morphine eclipsed opium, and the hypodermic needle brought quicker results to the forlorn, and a more grievous peril to the medical professionals. Malleck effectively illustrates how newer and more potent drugs directly led to legislation against substances that could be used for malicious means, and yet left it open to medical and personal use. This began a long standing feud between the physicians who prescribed the cures and the druggists that formulated them. Added into the mix was the cultural implications that opium brought along. Exotic and foreign, opium was at once two distinct things. In medical preparations it was a wonder drug, in its raw form, a sticky, smelly vice thought to be found in thieves dens, utilized by the lower-class, smuggled by criminals, and forced by foreigners onto those unlucky social-elite who were ensnared. Malleck thoroughly shows us through court documents and missionary testimonies how these perceptions gave weight to moralist views this drug as a bane on white-Christian Canadians, and a populace who feared foreigners that would work for less. Missionaries stressed that the opium scourge was brought upon about by the guilt by association Canada had with Britain and its Opium Wars, and yet Malleck offers a more rational view of opium’s history. While a drug and poison, it also was different from alcohol in its societal impact and acceptance due to its sedative nature. Malleck vividly depicts how sensationalism, misunderstanding, and the threat to the practise of medicine fuelled the new concept of addiction distinct from insanity and moral depravity. 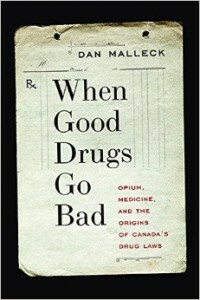 Malleck’s scouring of all available records provides a rich understanding of how the social and cultural factors surrounding opium in Canada set the stage for the moral debate over drug use. However, by disregarding a deep exploration of most other substances, the reader gets the impression opium was the driving force shaping the public’s understanding of drugs and that this directly led to legislation. In reality, as the last few chapters illustrate, the major push came from doctors, pharmacists, and their fears of an economic impact from newly appearing proprietary medicines sold in department stores. His final chapters successfully plot the development of legislation from controlling poisons, to limiting unknown preparations, and finally restricting the realm of recreational substances to medical uses. His thorough analysis and ability to draw on a mountain of records to seamlessly tell the story provides the reader with a new found appreciation of the complex development of drug legislation in the modern era. Joel Rudewicz, M.A. History, has held various positions as a researcher, archivist, conservator and museum curator. His most recent permanent exhibition explored the history of spinal surgery at the Mütter Museum of the College of Physicians of Philadelphia.